Two weeks ago I arrived back in Boston from almost a month in Johannesburg and the Kruger National Park (the Park). To quote Charles Dickens “It was the best of times and the worst of times.” I left with what at the time was an undiagnosed abdominal issue and exacerbated the condition by falling into a shower stall one night and hurting my back. Driving over excessively bad sand roads in the Park only made the pain worse. The “best” was simply being there—among family and friends in Johannesburg, and then in the magical Park. I have been going to Kruger since I was a kid of three and later, together with my husband, we took our sons from their infancy. One of my sons shepherded me through the Park this time. I realized how deeply our family imprint was in him. Up at 5.30 am every morning, driving until around midday. And then a late afternoon drive until the gates at the camps closed at 5.30 pm. Exhausted, yet we could not absorb enough of the bush veld: lions, cheetah, elephants, buffalo, rhino, hyenas, many other animals, glorious, multi-hued birds and surprising blooms among the tawny brown and shimmering grasses at mid-winter. The edenic Orpen Dam, and on and on. The secret to being in the presence of the spirit of the bush is to drive at about five to ten miles an hour and not complain about the wash boarded roads. We stayed at Olifants camp, in the middle of the Park (longitudinally) but almost on the Mozambique border on the east. 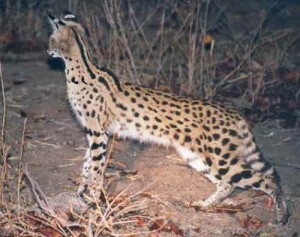 We went with a guide on a night drive and saw a serval (see photo above taken from the internet), one of the rarest animals you’ll ever see, as well as spring hares (look like baby kangaroos), scrub hares, genets and other nocturnal creatures. This drive was definitely a highlight. Olifants is built overlooking the Olifants River and is my favorite camp. There is an indefinable peace there that allows you to be positive about the interconnectedness of nature. The vegetation is thick thorn bush scrub perfect for elephants and we saw plenty of those magnificent creatures. Next we went south to Satara where the vegetation is open grass lands perfect for antelope, rhino and predators. We witnessed glorious sunrises and sunsets, stopped at many overlooks of rivers and dams. At one, way below on the rocks, a lone male baboon sat looking meditatively into the sunset, a quintessential African scene. There were others such as: a large herd of elephants silhouetted in the middle distance from the road blowing pink dust into the air backlit by the pink-red setting sun. Satara has a dark, brooding feel. The rondavels (round huts for sleeping) are built in large circles facing inwards reminiscent of the Boer laagers when the Boers trekked north with their slaves to escape the new British emancipation of slaves laws. But once out of the camp you are surrounded by and can revel in the African bush as described by the early pioneers and explorers around the turn of the twentieth century. Our final camp was Lower Sabie where—for one night—we had a tented cabin placed at the electrified camp fence and only yards from the Sabie River. The night chorus was constantly underscored by the deep bass grunts of many hippos. The stars (magnificent wherever we were) seemed close enough to touch and evoked a quite appropriate mystical response. Lower Sabie is riverine terrain and filled with animals coming and going to the river. You are guaranteed to see lions and other predators on the famous Lower Sabie road. Indeed, we saw five lionesses and a young lion walking purposefully almost on the road, and more lions at Timbavati. Another first for me on another night drive was seeing an African porcupine. I had no idea they were so large. Definitely I will not wait for many years to pass before I visit the park again. I only hope Park management can improve the provisioning of the camp stores and the standard of food in the restaurants; it was dreadful. It was so fun reading about your adventures. I have one question for you though at you last camp you said you could hear the grunts of Hippos, that must have been pretty amazing, but how was the smell? Maybe on your next trip I could give you a bit of advice as I did Dominic. During every meal drink a alcoholic beverage and I bet you wont get food poisoning again. Ha!ha! I surprised to see that a lot visitors come hear to view and comment on your weblog. Now I confess that you have a skilled blogger. Thanks for nice post. Keep on it.